Its Easter time again which means it is the time for chocolate eggs, bunnies and Hot Cross Buns. 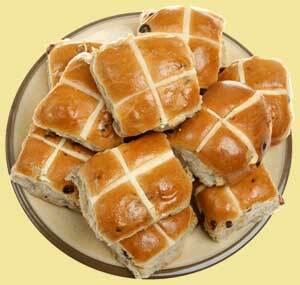 Making your own Hot Cross Buns is easy and so much fun, especially if you involve children. Not to mention of course they are going to taste so much better than the store bought variety. Taking your frustrations out while kneading the dough, that waft of yeast fermenting, the wonderful aroma of the baking process will be sure to get the mouth watering, the taste buds tingling, eager eyes awaiting and impatient children with expectations high of having the first one the moment the oven door is opened! No fancy equipment is needed and the proving can be done in the warming drawer of your oven or even the hot water cupboard. Adjust spices and fruit amounts to suit your own taste.